Tiffany & Co Diamond By The Yard Studs, 18k, Retail $1175!! Hermes Arceau Model AR4-910a, Automatic, 43mm Gorgeous! Tiffany & Co Darling Airplane Necklace, Sterling Silver, Original Packaging! New listing Tiffany & Co Large Blue Knot Key, Original Packaging! 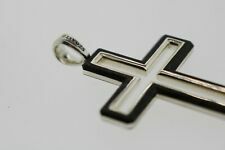 David Yurman Forged Carbon and Silver Cross, retail $450! 30" Tri-Tone 14k Gold Rosary, Gorgeous!